Alexandria Snake Control and Snake Removal! Snake Removal and Snake Control is a very common call that Animal Control Solutions receives throughout spring, summer and fall. Snake activities tend to die down in Alexandria and the surrounding areas in the wintertime. 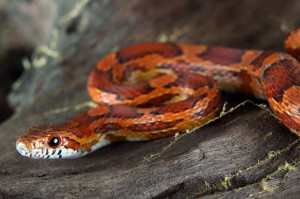 Many non-poisonous snakes are mistaken for venomous snakes since they can look almost identical to the poisonous snakes found throughout Alexandria. Most of our customers report seeing a copperhead looking snake near there home ,however, we have found that on most occasions, the snake will either be a rat snake or one of several garden-variety snakes that can be found throughout Alexandria. It is always recommended that you should always have someone that is trained to handle snakes remove the snake from your property. Most snake bite injuries are due to people handling snakes without being trained on how to tell if the snake is poisonous. The copperhead is the most common venous snake found throughout Alexandria and the surrounding areas. This snake is commonly between 36 and 40 inches long with black hourglass shapes across its entire length. The main coloration of this snake is the color of a copper penny. These snakes can be very aggressive and very venomous. They should never be approached and a professional wildlife removal company should always be contacted to remove the snake. Cottonmouth Snakes are also found within Alexandria and the surrounding areas. These venomous snakes typically are found in streams and other water sources or laying on rocks near the water. The typical length of a Cottonmouth Snake is about 3 feet in length though some may grow to be 4 to 5 feet long. Its color is an olive green or brown with dark brown bands around its back and sides. The bands may be difficult to see and can appear almost black. If you have a snake that you are not sure about, call Animal Control Solutions! Never take a chance, call 703-881-3170!